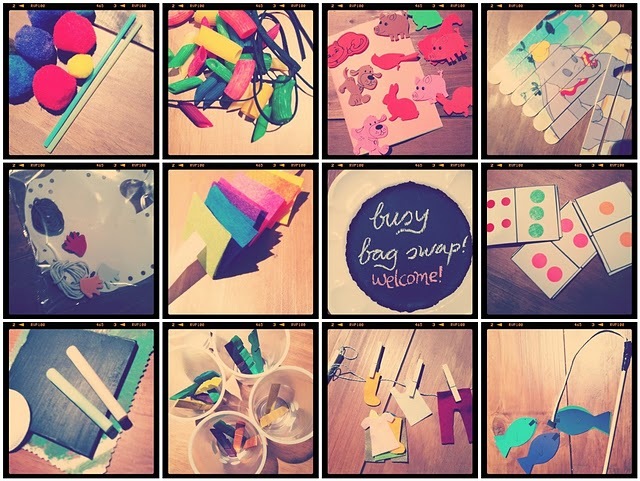 Bubby Makes Three: Our "BusyBag" Swap! Sorry folks, I did mean to share our busybag swap with you earlier this week but I've been a tiny bit busy planning sonny-boy's birthday party (a teddy bear's picnic) which is this weekend... as usual I've bitten off a tad more than I can otherwise chew but I'm sure it'll all work out on the day!! AND I have no doubt it will be fodder for a billion blog posts next week as I debrief on all the gory details, friends! Last week, I posted about the concept of the busy-bags and a how-to on making your own mini-chalkboards; my own creative contribution to the project! Aside from being a great way to meet new people and get involved in something crafty (even if you don't believe you are v artistically inclined) -- there is something self satisfying about having a little box filled to the brim with crafty activities to entertain your young-un's at a moment's notice... I'm hiding mine and bringing them out one-by-one -- yesterday I pulled out the coloured noodles and Fern had a blast for half an hour while I was madly tearing about tidying up the house creating "noo-noo" necklaces! And the best bit is that each activity is designed to be packed away and used again... how handy is that?! Seriously folks, have a think about doing this in your area -- I can't rave about it enough! Anyway -- there is a Teddy Bear's picnic in two days... and I havn't quite got around to planning a menu yet. Best get onto that. Have a great weekend... pray for good weather for me? A Teddy Bear picnic is not quite so glam hosted in the garage!! I absolutely LOVE this idea. This whole concept is genius! Fun and creative and exceptionally cool. I hope my mothers group is up for the challenge! !